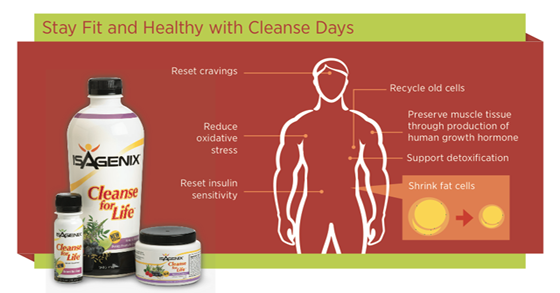 Cleanse Days do more than fuel fat loss–they support overall health and wellness. Are your hard-earned abs trapped under a layer of flab? The secret is out: the Isagenix nutritional cleansing system is the key to making your muscles “pop.” By combining fat-busting Cleanse Days with muscle-building Shake Days, you could be sporting that six pack and tight body you’ve always wanted by summer. Building muscle and shedding unwanted body fat at the same time can be difficult because a certain amount of calories and high-quality protein must be eaten to prevent muscle breakdown. That’s where many diet plans go wrong. Sure, you will lose weight quickly on popular juice cleanses and other very low-calorie and low protein diets. But most of this will be water and muscle, and little will be fat. In the aftermath of the crash diet, you will be left with a slower metabolism, a less shapely physique, and an exceptional ability to store fat quickly. That’s where the Isagenix system is different. The Isagenix nutritional cleansing system is designed to transform your body by allowing you to build muscle and burn fat while keeping metabolism high. The secret lies in the combination of scientifically supported Shake Days with Cleanse Days. During Shake Days, the right type and amount of protein is consumed to maximize muscle synthesis when coupled with weight training. During Cleanse Days, the body efficiently melts away fat. Although taking a day or two to abstain from eating on Cleanse Days may seem counterintuitive for muscle-building goals, disruption to the muscle-building process will be avoided when cleansing is done right and in combination with weight lifting during high-protein Shake Days. Studies have shown that Cleanse Days, or intermittent fasting as known to the scientific community, are great for obliterating fat stores and transforming the body, even in the muscle-minded. To say fat is a fact of life is an understatement—fat is a fact of about 40 billion cells! That’s how many fat cells the average adult has, and unfortunately that number can only increase; it can’t decrease. Think of fat cells like balloons. They start to fill up whenever calorie intake exceeds calories burned, and keep on inflating until they can’t inflate anymore. Once this happens, it can trigger the creation of new fat cells that are ready to be filled (1). Even though the body cannot lose any fat cells, it can still shrink them into almost nonexistence. Cleanse Days help in this process because more calories are burned than eaten so the body will start to use fat for fuel, and this causes fat cells to shrink. Performing Cleanse Days on a regular or semi-regular basis means you’re giving your fat cells a repeated dose of fat-cell shrinkage, which equals more visible muscle and a more toned body. Cleanse Days boost muscle-building compounds, helping to prevent muscle loss Not only is human growth hormone an important part of muscle building, it also plays a role in preventing muscle breakdown and increasing fat burning. Cleanse Days are known to boost production of growth hormone (2). Fasting for just one day has been shown to increase growth hormone by an average of 1,300 percent in women, and nearly 2,000 percent in men (3). This increase in growth hormone is one of the main reasons why completing a Cleanse Day will not abolish long-term, muscle-building goals. Growth hormone helps to defend against muscle loss on Cleanse Days by increasing the body’s use of fat for fuel. By forcing the body to rely on fat stores for energy rather than on protein hijacked from muscle, muscle loss can be minimized and fat burning can be maximized. Additionally, fasting increases the body’s sensitivity to insulin, which is another hormone important to muscle-minded people (4-6). Insulin is important for muscle growth because it helps deliver sugar eaten during a meal to muscle where it can be used for energy during activity. Sensitivity to insulin is critical for meeting muscle-building and fat-burning goals because dietary carbohydrates can be efficiently used by muscle to stimulate growth rather than being converted to fat. The IsaLean® and IsaLean Pro Shakes offer the perfect post-Cleanse Day nutrition to stimulate maximum muscle building. Both are high in whey protein, which is superior to other protein types for promoting muscle maintenance at rest or for bolstering muscle building after exercise (7-9). This is because whey protein is high in the amino acid leucine, which is seen by the body as the trigger for muscle growth. In addition, whey protein is absorbed and delivered to muscle quickly, further strengthening muscle synthesis. Cinti S. The adipose organ at a glance. Dis Model Mech 2012;5:588-94. Norrelund H. The metabolic role of growth hormone in humans with particular reference to fasting. Growth Horm IGF Res 2005;15:95-122. Intermountain Medical Center. Routine periodic fasting is good for your health, and your heart, study suggests. Science Daily 2011, May 20. Dalzill C, Nigam A, Juneau M et al. Intensive Lifestyle Intervention Improves Cardiometabolic and Exercise Parameters in Metabolically Healthy Obese and Metabolically Unhealthy Obese Individuals. Can J Cardiol 2013. Halberg N, Henriksen M, Soderhamn N et al. Effect of intermittent fasting and refeeding on insulin action in healthy men. J Appl Physiol 2005;99:2128-36. Wolfe RR. Effects of insulin on muscle tissue. Curr Opin Clin Nutr Metab Care 2000;3:67-71. Witard OC, Jackman SR, Breen L, et al. Myofibrillar muscle protein synthesis rates subsequent to a meal in response to increasing doses of whey protein at rest and after resistance exercise. Am J Clin Nutr 2014;99:86-95. Yang Y, Churchward-Venne TA, Burd NA, Breen L, Tarnopolsky MA, Phillips SM. Myofibrillar protein synthesis following ingestion of soy protein isolate at rest and after resistance exercise in elderly men. Nutr Metab (Lond) 2012;9:57. Tang JE, Moore DR, Kujbida GW, Tarnopolsky MA, Phillips SM. Ingestion of whey hydrolysate, casein, or soy protein isolate: effects on mixed muscle protein synthesis at rest and following resistance exercise in young men. J Appl Physiol 2009;107:987-92. Leidy HJ, Tang M, Armstrong CL, Martin CB, Campbell WW. The effects of consuming frequent, higher protein meals on appetite and satiety during weight loss in overweight/obese men. Obesity (Silver Spring) 2011;19:818-24. Paddon-Jones D, Rasmussen BB. Dietary protein recommendations and the prevention of sarcopenia. Curr Opin Clin Nutr Metab Care. 2009;12:86-90.